Free Strong America PAC has released a video containing footage from Mitt Romney's September 11, 2010 trip to New Hampshire. Romney addressed the Seacoast Republican Women's Chili Fest in the GOP stronghold of Stratham. The video is classic New Hampshire presidential primary politics, featuring Romney talking about American values in a New Englandy back yard setting. What I notice watching the video is that what I like to call the "angry-faced" Mitt Romney from 2008 is gone. I always thought that voters had trouble connecting to Romney because he was too negative all the time, especially when compared to the smiling face of Mike Huckabee. You could hate Huckabee's policies, but still want to grab a beer or jam out with him. Now, there's something new in Romney's voice, call me crazy but it almost sounds like compassion. We'll see how long this new persona lasts. *Doors will open at 9:00 AM. Additional Information: For questions, please call 232-1162. We welcome you to invite friends and family to these exciting events. Is John McCain planning another run for president in 2012? That's a question you may be hearing a lot over the next few days, as McCain prepares to makes his second trip to the Granite State this year to campaign for Republican Senate candidate Kelly Ayotte. The duo will make appearances in Nashua and North Hampton this weekend. Picture of Kelly Ayotte and John McCain in Nashua in March of 2010. Back in March, McCain officially endorsed Ayotte at a town hall style meeting in Nashua. I attended that event and recorded the following videos. McCain was clearly thrilled to be back on the campaign trail in New Hampshire, a sign that he may be eager to jump back on board the Straight Talk Express. He may even be eying Ayotte as a potential running mate. Such a move would surely irritate Sarah Palin, who also endorsed Ayotte's campaign. Video of John McCain endorsing Kelly Ayotte in March of 2010. Video of John McCain and Kelly Ayotte discussing health care in March of 2010. Video of John McCain and Kelly Ayotte fielding a question about global warming in March of 2010. Video of Kelly Ayotte and John McCain talking about the economy in March of 2010. Video of Kelly Ayotte and John McCain taking a hard line on military tribunals for terrorism suspects in March of 2010. Video of John McCain and Kelly Ayotte answering a question about student loans and education in March of 2010. If you are a famous politician who is planning to run for president in 2012, why not use your star power to raise money and make new friends in New Hampshire? That's what Tim Pawlenty is doing. Tickets to an 8:00 AM breakfast with Pawlenty at the Villa Blanca Restaurant in Nashua cost $75. If you have any money left after the tip, head over to the Nickerson House in Windham for a reception with T-Paw - recommended donation $1,000. Last week, Pawlenty's Freedom First PAC endorsed more than 40 Republican candidates in New Hampshire. Each one took home a little petty cash as a prize. Among them are some of the most recognizable names in the New Hampshire Republican Party. Don't worry though, Pawlenty isn't just trying to earn brownie points at the top of the political ladder. He's aiming at the grassroots too, endorsing a total of seven candidates for sheriff in the Granite State and donating $250 to each of their campaigns. 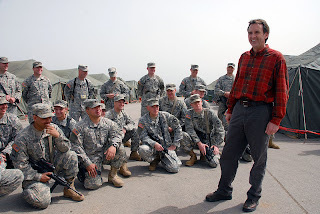 Tim Pawlenty doing his best "commander in chief" act. The flannel will play well in New Hampshire! Mississippi Governor Haley Barbour visited New Hampshire today to campaign on behalf of Republican gubernatorial candidate John Stephen. 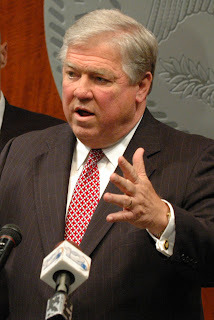 The Nashua Telegraph describes Barbour as a potential 2012 GOP presidential candidate. As the head of the Republican Governors Association, Barbour's influence certainly goes far beyond the borders of the backwater state he governs. Still, he is not very well known here in the Granite State. Barbour told reporters that he is working on an independent expenditure campaign designed to help Stephens beat incumbent Governor John Lynch in November. His trip to New Hampshire and fundraising efforts on behalf of Stephens may signal that Barbour is already laying the groundwork for a presidential run in 2012. However, Barbour told reporters that he hasn't made any decisions about running for president and probably won't until after the 2010 election season is over. The Lynch campaign issued a press release suggesting that Barbour's record as governor of Mississippi probably won't appeal to many voters in the Granite State. Under Barbour, the high school drop rate in Mississippi has increased by 16.9 percent took office and the state's economy has continued to stagnate, boasting the lowest per capita income in the nation. Haley Barbour. He looks kind of like a cross between Bill Clinton and William Shatner, but is not quite as well known and much less funny.